Karl Lagerfeld is a German brand created by the fashion designer of the same name. This exclusive line offers the latest fashion styles of Lagerfeld and combines a modern and chic look with classic styles. From bags to shoes to accessories, there are many options in the collection. With Big Apple Buddy’s personal shopping service, you can now buy direct from the Karl Lagerfeld online store anytime, anywhere. Complete your outfit with the Karl Lagerfeld K/Chic Handbag! It's a chic and modern bag that is easy to take everywhere and never again leave any essentials behind. With an adjustable strap, you are able to wear this bag however you like and customize to the occasion. 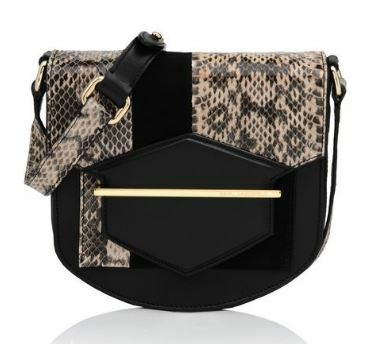 The snakeskin flap will make you stand out in the best way possible and make it easy to combine with your outfit. 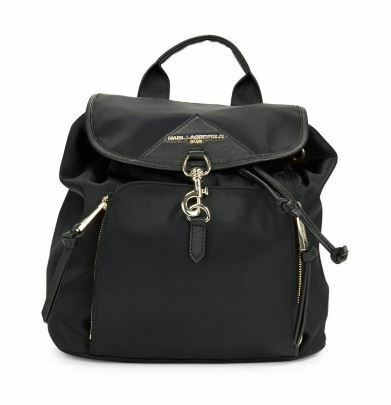 When you need more space, the Karl Lagerfeld K/Eyelets Backpack is the perfect solution! This cool, leather bag has plenty of room so you can take exactly what you need. Your items will be secure with the adjustable opening so you don't have to worry. Carry it your way! Whether you use the straps or the top handle, this bag is comfortable to take anywhere and will match whatever you wear. Show off your personality with the Karl Lagerfeld Leather Biker with Neoprene Jacket! It has a unique, long fit that combines a classic look with a modern style. It's perfect for those chillier days but will never be too heavy or hot for when you wear something underneath. You've also got plenty of pockets to take what you need while the black leather gives it a daring look that will make a statement. Unfortunately, the USA Karl Lagerfeld online store does not currently offer international shipping. However, Big Apple Buddy, your personal shopper, can help you buy products direct from the official USA Karl Lagerfeld online store and ship them to your doorstep, no matter where you are in the world. We offer international shipping to over 190 countries including Australia, Austria, Bahrain, Belgium, Bosnia & Herzegovnia, Brazil, Brunei, Canada, China, Croatia, Cyprus, Denmark, Estonia, Finland, France, Germany, Hong Kong, Hungary, Indonesia, Ireland, Israel, Italy, Japan, Kenya, Kuwait, Lithuania, Macau, Malaysia, Maldives, Mexico, Namibia, Netherlands, New Zealand, Norway, Oman, Pakistan, Portugal, Saudi Arabia, Scotland, Serbia, Singapore, Slovenia, South Africa, South Korea, Spain, Sri Lanka, Sweden, Switzerland, Taiwan, Tanzania, Thailand, UAE, UK and Ukraine. If you would like to buy from the USA Karl Lagerfeld online store, simply let us know which items you would like to order (by filling out the form on the right) and we’ll get back to you with a free international shipping quote within 24 hours!